Here is my second addition to the Christmas Gift Guide! This one is for the men in your life. Check out my Christmas Gift Guide: For Her right here. I added a mix of stuff that different men would love! I hope it helps! The Tie Bar: Which man doesn't need more socks, pocket squares and ties! This is the perfect set for that and they are a mix in different colors. 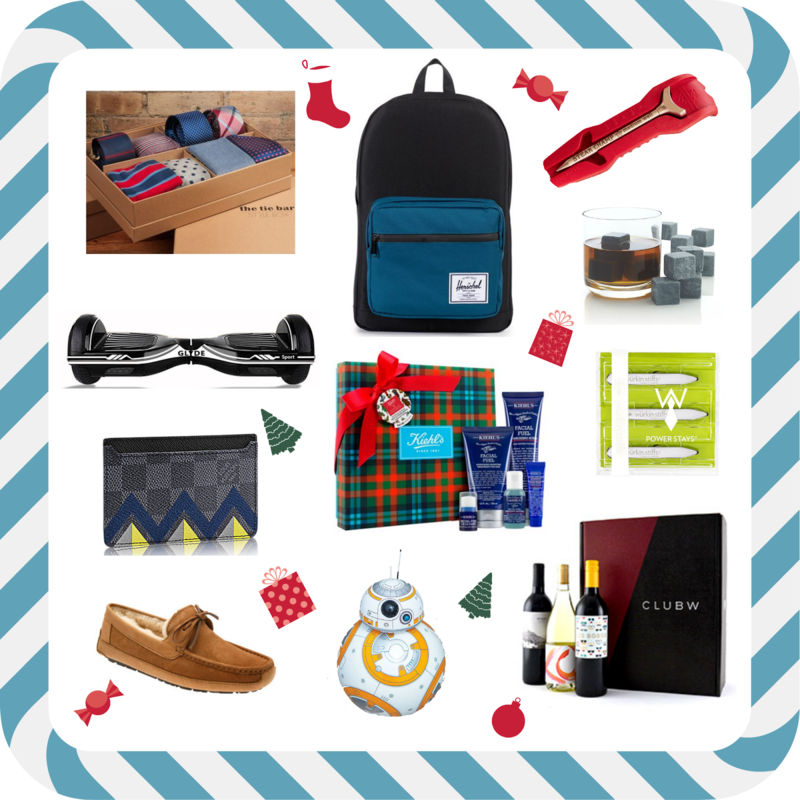 This is a perfect gift for a guy who loves fashion and loves to dress up. Instead of spening over $200 on an expensive tie which is the same quality as this collection, buy this as it has various options. If you want that sock and tie game strong, get this awesome gift! Herschel Supply Co.'Pop Quiz' Backpack: Men usually like to use backpacks whether its everyday use or while traveling. I think any man would use one of these. They fit in a lot and are great quality! Plus, they are affordable. I love that they have different colors depending on one's choice. Steak Champ,The Ultimate Steak Thermometer: This is for the guy who loves cooking, especially one who loves his steaks. This is a neat and handy product that any man would love and appreciate. It is a thermometer for meats and is easy to use with an LED light that flashes 3 different colors based on the doneness of the steak. Any guy who loves to grill will love this! The battery lasts for 10-20 years based on cooking one steak per week due to modern LED technology. How cool is that? Glyde Board: I think this has become such a new trend and so many people have been buying these. I think your guy would love this cool and sporty looking Hoverboard. They are basically electric scooters that you put your two feet on and ride around. This would be such a great gift and even though its pricey, it is worth it for the tech lovers! Whiskey Rocks: If your man loves a good scotch or any other drink on the rocks, this would be a serious must have. These cubes keep drinks cool without watering them down, prolonging appreciation of the flavors of drinks. You can also use them for warm drinks to prolong warmth. Such a great idea for someone who appreciates the flavors of his spirits! These can also be a great stocking stuffer or given with a great bottle of whiskey as a gift. Louis Vuitton Card Holder: I had to put in something pretty and luxury and this time its a card holder. I love how card holders have taken the place of wallets, especially for men because they usually put their wallets in their pockets, which become bulky and uncomfortable, unlike us ladies who have bags! I love Louis Vuitton and their quality. It is a great luxury item for a man and I absolutely cannot get over this neon pattern. I love that it has the classic Damier graphite canvas and this striking pop of color. Kiehls Men's Energizing Collection Set: Who says skincare isn't essential for men? This set is pretty awesome because it has some great products every man would want to use. Kiehls is a great brand for men as well when it comes to skincare! If you are trying to get your man or brother into using great skin care, this is a good starter kit. It has a face scrub, a face treatment, face wash, shave cream and a eye cream(basically everything he needs). The scent and quality are amazing too! Wurkin Stiffs 2.5" Power Stays: My boyfriend highly suggested this product and literally forced me to put it in this gift guide. He says it helped him and any man would appreciate it this in his stocking or just as a add on gift! I didn't see what the fuss was about until he gave me a full tutorial on it. It is basically these magnetic buttons and stays which keep your collar in place. You put the stays inside the collar and the magnet behind it for it to be locked in. When wearing a shirt without a tie it doesn't making the collars look sloppy. Everything looks in place and total perfection! UGG Moccasins: It's getting cold and what better gift than these comfortable cozy shoes. I love moccasins and it's great that they have some for men now! Cozy and cute! BB-8™ App-Enabled Droid By Sphero: Another one for a tech lover who is still a child at heart and someone who is obsessed with Star Wars! This app-enabled Droid&trade; whose movements and personality are as authentic as they are advanced. Based on your interactions, BB-8 will show a range of expressions and perk up when you give voice commands. It's pretty cool in my opinion! I would youtube the video on how this baby works! Club W Subscription Box: I love to recommend subscription boxes and this one is something anyone would love to receive, especially the men in your life. For those vinos, each month Club W will make new recommendations for you based on your palate profile and you receive 3 bottles a month for a $39, plus a flat $6 shipping rate. Perfect for someone who wants to try new wines or learn more about it. I hope these recommendations help you all! What are you gifting the men in your life?